The entrance to the once elegant Madison Lenox Hotel bleakly bars all visitors. 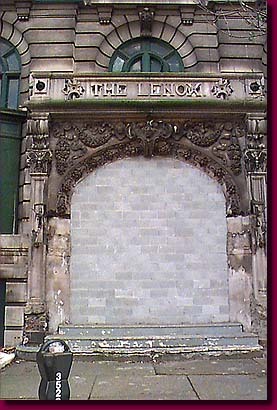 The Madison Lenox Hotel sits in fabulous decay on Detroit's once elegant and now reviving Madison Avenue. Its bluntly bricked arched entrance suggests that it might be restored in spite of severe damage sustained by neglect and from "grave robbers" who have made off with some of its carved masonry.